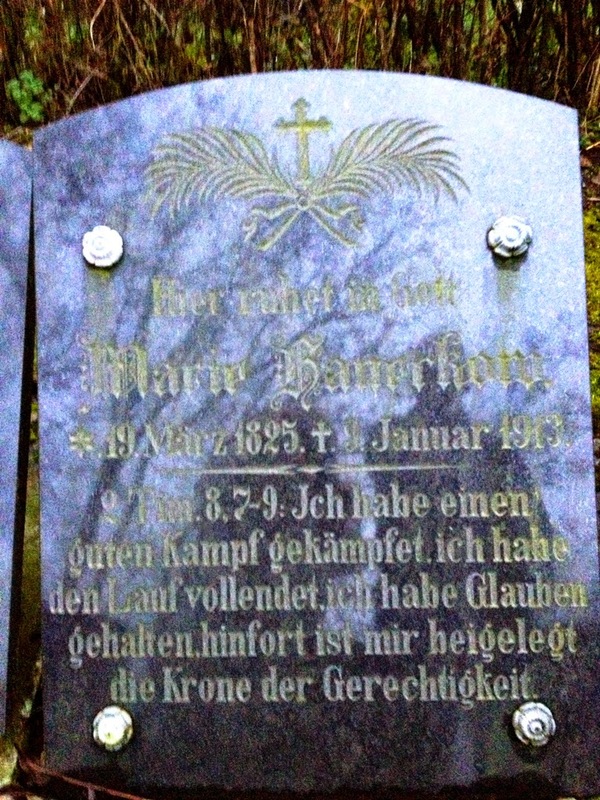 Friedrich Wilhelm Hanekow (Wilhelm) and Maria Charlotte Goetsch were married in the church at Battin on February 15 1874. The wedding was presided over by Pastor Sauberzweig. Church records state consent was given by Wilhelm's mother, Anna Christine Hanekow (formerly Kerstin) and by August Friedrich Goetsch, Marie's father, of Brussow, who worked as a barber in Prenzlau. Wilhelm was forty five years old, Maria was twenty. The church at Battin, May 5 2016. Courtesy of Ulla Kilias. One month later, they departed for Hamburg, the first leg of their journey to Rogers City in Presque Isle County Michigan. Michigan in 1874. Presque Isle County is in the north eastern corner of the state. Macomb County, in the vicinity of Detroit, is in the south east. Their decision to resettle in a small, remote, town over 5,000 miles away was influenced by friends and possbly family members already there. Their grandson Alfred Haneckow later recalled being told members of the Slager (Schlaeger?) Brege and Bade families that they already knew assisted them when they arrived. The families were part of a group of early Presque Isle county settlers that included the Kartens, Schlaegers, Bredows, Brunings, Klees, Altmans, Haselhuhns, Kortmans, Hopps, Brandts, and others from the vicinity of Brussow, near Battin, according to Donald Knopf, an expert on the first Prussians to the area. Those families were among an immigration of Prussian "Old Lutherans" to Wheatfield in Niagara County New York that began in 1843. "Old Lutherans" rejected the union of the Lutheran and Reformed (Calvinist) churches mandated by King Friedrich Wilhelm III of Prussia in 1817. Labeled as "Separatists" they were persecuted and driven to worship in clandestine services. Some sought emigration as a path to religious freedom. Most of them who went to Niagara County were followers of Karl Wilhelm Ehrenstroem, who preached in Brussow and the surrounding villages in the northern Uckermark. Upon arrival they established three settlements: Martinsville, Neu Bergholz and Neu Wallmow in Wheatfield New York. Successive waves of immigrants from Brussow and neighboring villages joined them over the next three decades. Starting in the 1850s, when farmland was no longer readily available in Niagara County, some proceeded west. 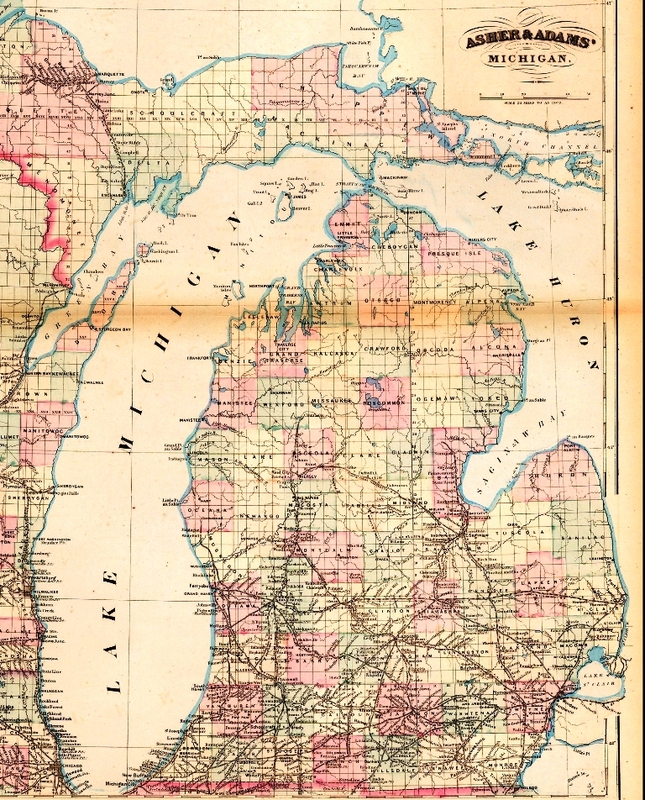 According to Uprooted From Prussia Transplanted in America by Eugene W. Camann "The locality which attracted most of those moving at this time was Macomb County Michigan". It was in Macomb County, in 1869, that a number of former Uckermark families responded to advertisements placed in Detroit area newspapers promoting Rogers City. The advertisements were placed by Alfred Molitor, one of the founders of the townsite, and an owner of Rogers and Molitor Steam Sawmill located there. The town "...was planned not just as a timber and sawmill operation, but as a community - a city surrounded by farms, in the style of Europe at that time." according to Gerald Micketti and Mark Thompson in Almost and Island, Early Histories of the Shoreline Settlements in Presque Isle County. "A strenuous effort was made to encourage farmers to settle in the area." In addition to the before mentioned Bade, Brege and Schlaeger families, it is quite possible that the Karsten family were the same Kersten family of Wilhem's mother. It is also possible that Maria, being from Brussow, the center of Ehrenstroem's followers, was connected by friendship and family ties to the settlers. It has also been noted that Goetsch was a long standing last name in Rogers City, perhaps an indication of kinship. 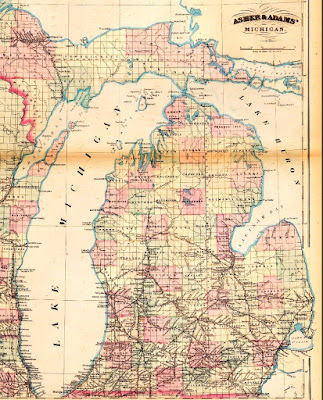 Another factor in their decision to go to Michigan might have been Wilhelm Erdmann Hanekow and his wife Wilhelmine Christine (Schulz), from the village of Bietikow, approximately 15 miles (25 km) southeast of Battin, who came to Macomb County in 1872. Hamburg to Hull to Liverpool. On March 20th 1874 Wilhelm and Maria boarded the steamship Minerva in Hamburg, destined for Hull, on the east coast of England. Hull was the primary entry point for European emigrants on their way to Liverpool, where transatlantic steamships departed for New York. Hamburg-Hull-Liverpool-New York was the most common indirect routing for emigrants from northeastern Germany to America. 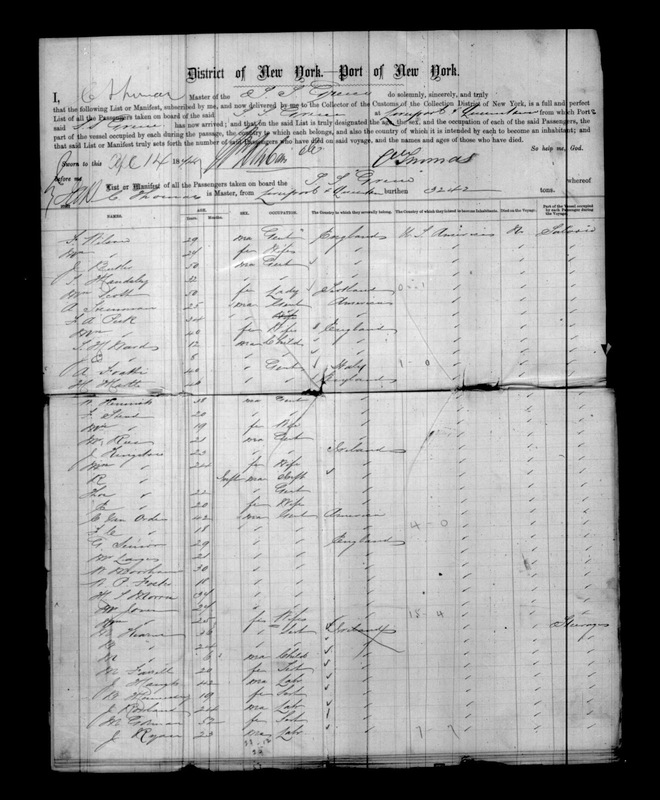 Hamburg passenger list for the steamship Minerva, listing Wilhelm and Maria Hanekow, March (Marz) 20 1874. The Minerva was owned by H.J. Perbach & Company. It was built in 1863 for North Sea service between Hamburg and Hull. The ship was a steam and sail driven three masted schooner, propelled by a single screw. Its iron hull was 191.9 feet long with a 27.1 foot beam. Upon arrival in England Wilhelm and Marie likely proceeded to the North Eastern Railway Company's large emigrant waiting room near the Hull Paragon Railway station. The facility had been built in 1871 amidst local concerns regarding perceived health risks brought in by the large numbers of migrants passing through. 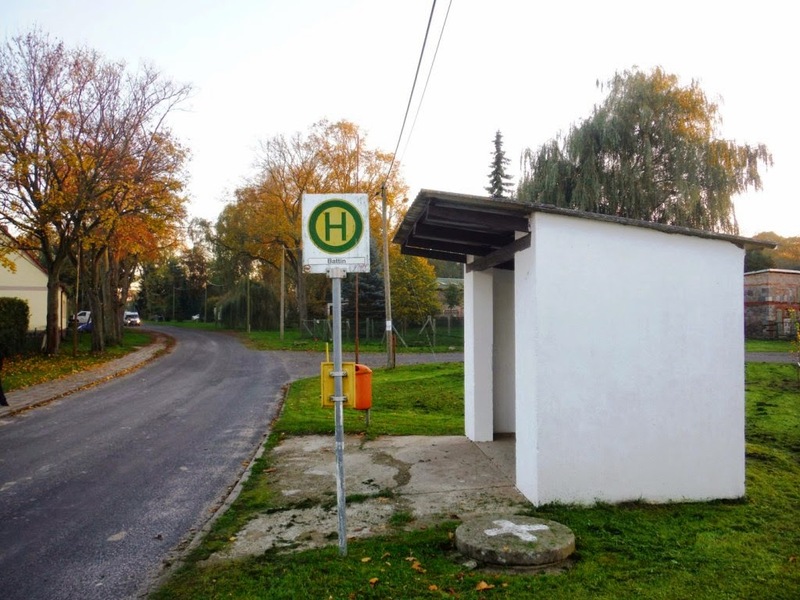 It provided shelter, washrooms, and the opportunity to meet with ticket agents. It is possible they then availed themselves to one of the local emigrant lodging houses for an overnight stay. Whatever the case, it was rare for emigrants to be in Hull for longer than 24 hours. From Hull they traveled on the North Eastern Railway company to Liverpool where they boarded the SS Greece for the Atlantic crossing. 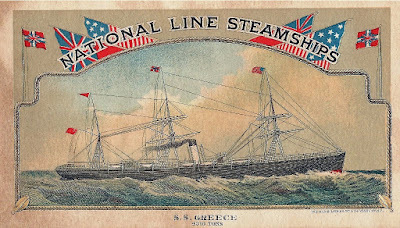 The SS Greece belonged to the National Steam-Ship Company, popularly known as the National Line. 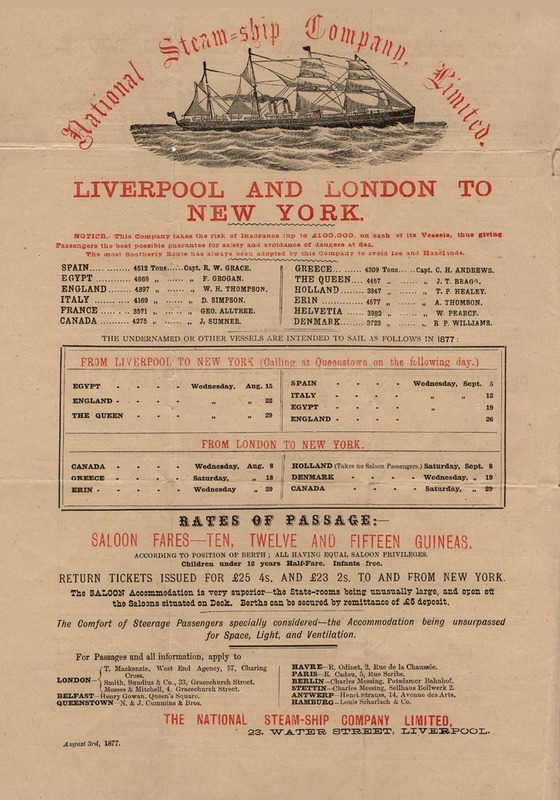 Established in 1863, it was the first transatlantic line to offer service from Liverpool to New York City. In 1874 the National Line's fleet consisted of the Canada, Denmark, Egypt, England, Erin, Greece, Holland, Italy, Spain and The Queen. 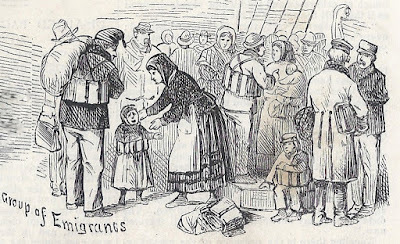 Emigrants were an important part of their business, to whom they advertised: "The Comfort of Steerage Passengers specially considered - the Accommodation being unsurpassed for Space, Light and Ventilation". 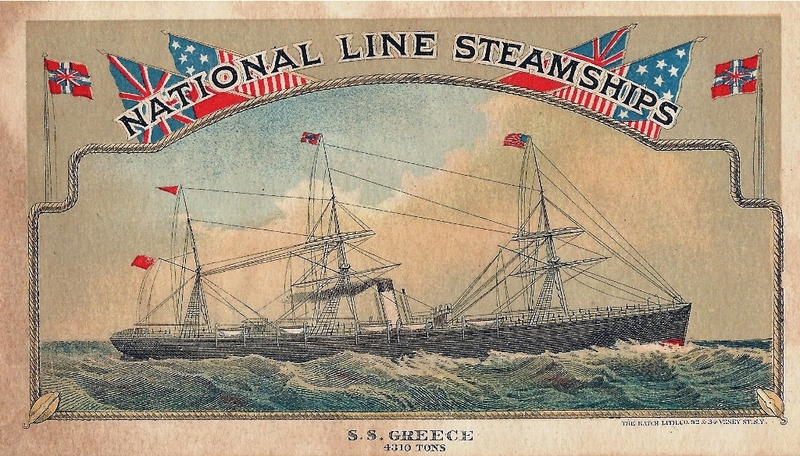 "The Greece is one of the best vessels owned by the National Line. She is 390 feet in length and 42 in breadth. From her metallic deck to her ceiling she has a depth of 35 feet. She is rated at 4,400 tons burden. Her engine-room is 50 feet long, and her machinery is pronounced to be of the very best description. She has two vertical, direct acting compound engines of 500 nominal horse power, but which can be worked up to 3,000. Her machinery was made and set up by Laird Brothers, of Birkenhead. She has one smoke stack which is painted white nearly up to the top, thence up black, making a striking contrast. She is bark-rigged, with double topsails and studding sails, and should any accident happen to her machinery she could make the same time as a first class sailing vessel. Her arrangements for the accommodation of passengers are complete. Her state rooms are all upon the saloon-deck and open into that apartment. These can accommodate 150 persons. Her steerage is large and well ventilated, and there is ample room for 1,400 passengers". Wilhelm and Maria departed Liverpool on March 24th 1874, five days after they started from Hamburg. The next day, the Greece stopped briefly at Queenstown Ireland for more passengers. Upon leaving Queenstown there were 520 steerage passengers, 29 cabin passengers, a crew of 104 and a single stowaway on board, - a total of 655 persons, about one third of the ships capacity. "We encountered an uninterrupted succession of head winds, frequently reaching a gale against which the Greece could do little more than maintain her position. On the morning of the 2nd of April, our seventh day out, being then only 1,000 miles from Liverpool, a vessel came on site from the south east, steaming in what seemed to be a course parallel to our own. For some hours she seemed to remain at the same distance to us, but at about 3 P.M. we saw that she was drawing nearer and soon discovered her to be a French steamer flying signals of distress". "The Europe left Havre on Thursday afternoon, March 26th. In passing the bar a slight jar was felt, and some of the passengers remembered that an anchor from a merchant vessel had been lost there some time before. It is thought that an injury came from grazing the fluke of the vessel. She was originally a side-wheeler and made her first trip in May 1867, under Captain Lemairle, who commanded her on this last voyage. 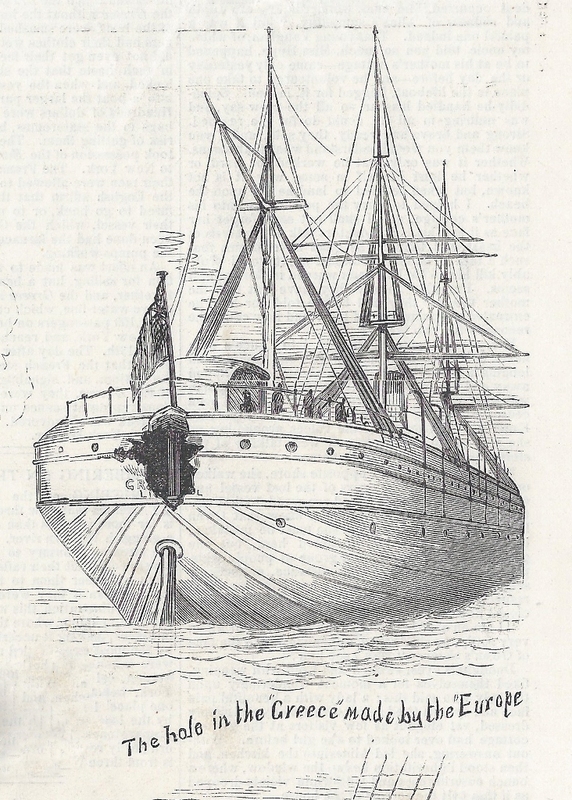 In 1872 she was lengthened to 410 feet and altered to a propeller. Her 2,000 tons of freight, said to be valued at $2,000,000 included 8,000 baskets of wine. At Brest the steamer stopped a few hours, and then steamed into the Atlantic. On Sunday, water was discovered in the engine compartment under the machinery, and a storm was coming on. By Tuesday the leak became serious, and the pumps worked constantly. Meanwhile the storm increased, and on Wednesday the vessel was rolling frightfully. She was then 891 miles from Brest. Few passengers slept during Wednesday night, for the storm raged with terrible fury. It abated, however, after daylight. Towards noon a steamer was sighted, westward bound. It was the Greece of the National Line. A few hours later the passengers of the Europe were startled by the boom of a gun and then, for the first time, they learned from the reticent officers that the vessel was filling with water. The Greece soon came within hailing distance, and after a few words of explanation, a transfer of passengers was ordered". 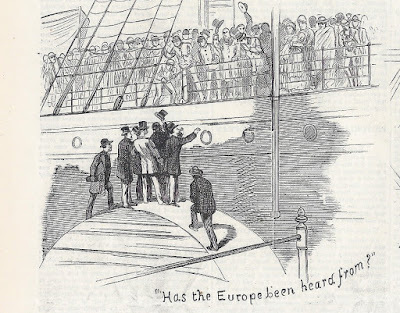 Passengers from the Europe being taken aboard the Greece. 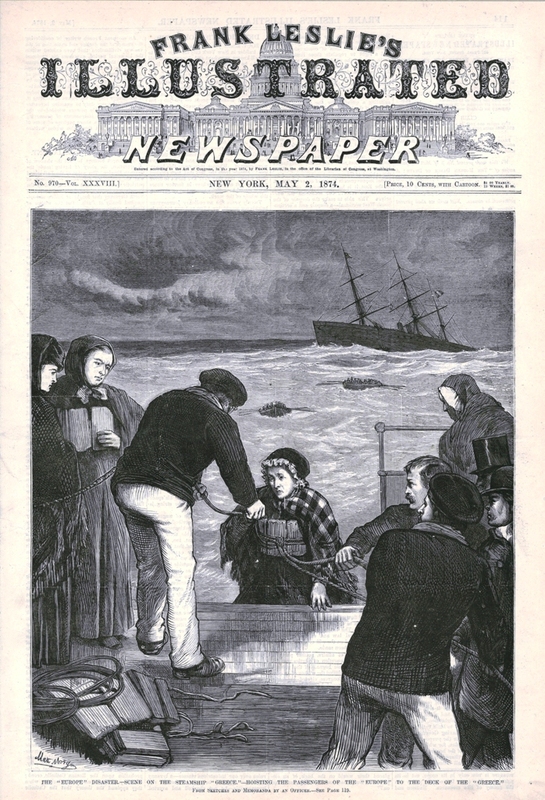 The cover page of Fred Leslie's Illustrated Newspaper, May 2 1874. For two hours that afternoon, into the evening, lifeboats from both ships ferried the passengers and crew from the Europe to the Greece, with no loss of life "...not without great difficulty." according to G.F.T. Reed to the New York Times. "...the officers and men of the Greece worked as if their own lives depended on their efforts. The boats were cleared away, the crews crowded into their seats, and were soon struggling with the heavy sea on their errand of mercy. In the mean time the Europe had launched their boats, and shortly after our First Officer had reached the leaking vessel the first French boat, laden with women and children, were on their way to us. We watched with great anxiety their progress. At times the high waves would hide them completely from our sight. When she reached the side of our vessel every soul on board the Greece was ready give a helping hand; ropes were thrown into the boat and slipped round the waists of the sufferers; a hundred willing hands lent their aid, and one after another of the unfortunate were safely landed on our decks. After this, the boats arrived in quick succession, and by 7 P.M. the last soul had left the Europe, and that splendid vessel was deserted to be tossed around by the waves of the Atlantic". 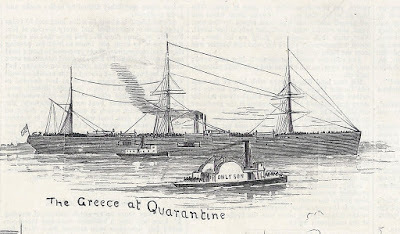 The Greece kept beside the stricken ship overnight. In the heavy seas the lifeboats that had been used for the rescue were lost, except one. The next morning, Chief Officer Buck and a volunteer crew of 25 boarded the Europe with a plan to sail it to Liverpool. They rigged the Europe to sail, but needed assistance to turn into the wind. A tow line was fixed between the two ships. As the Europe came about it collided into the stern of the Greece, an incident the seriousness of which would vary in latter tellings. The salvage crew sailed the Europe for two days. Water could not be pumped out fast enough to keep up with the amount coming in. The weather was worsening when they sighted the SS Egypt, another National Lines ship, bound for Liverpool. Buck signaled the Egypt regarding the Europe's condition. 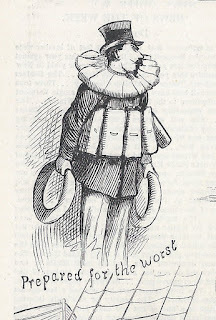 An attempt to tow the crippled ship was agreed upon, but as the barometer continued to drop, Captain Grogan of the Egypt ordered the salvage crew to abandon the vessel. The Europe drifted away, not to be seen again. 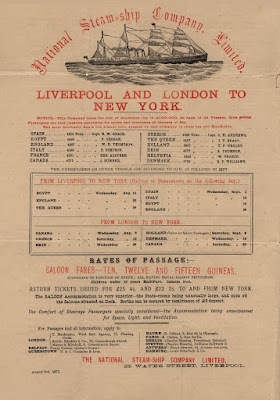 Upon arrival in Liverpool, the story of the Europe's loss, and the rescue of its passengers and crew was picked up by the press and transmitted by the transatlantic telegraph cable to New York, where the Greece would be anxiously awaited. The Greece had continued west with 1,039 passengers and crew crowded on board, a reduced compliment of lifeboats, and a hole in its stern from the collision. On April 11th, eight days after leaving the Europe, it was sighted off Nantucket Island from Siasconset Massachusetts. Two days later a violent gale was reported off the New Jersey coast. On April 14th the ship was seen off Sandy Hook, prompting crowds to gather at the National Line's Manhattan pier. "When 8'oclock came and there was no signs of the Greece, or any of the tugboats that had gone down to her with the officers of both companies, the watchers grew impatient and began to fear the watchers grew impatient and began to fear the possibility of falsity of the announcement of the Greece's being in the Lower Bay. This doubt was removed by the continued absence of tugboats, and the preparations at both piers for the passenger's reception. Therefore the people strained their eyes in trying to peer through the darkness, and discover the mammoth hull of the English steamer in the neighborhood of Governor's Island. The river was being traversed by many tugs and ferry boats carrying the green, red, and bright night lights, and oftentimes persons shouted "Here she is!" when they saw all three lights at once, as they must belong to a vessel coming up river. At length it was rumored that the Greece would not be brought up until morning as she was too large to be handled with safety on the river in such darkness. The tug boats were expected up, however, so the people remained, and their numbers were augmented every minute. When they had almost grown weary of watching and looking far down the bay, someone looking across the river towards Jersey City exclaimed, "Why there she is!" All eyes were turned that way immediately, and saw her great black hull and towering spars lit up with lanterns about four cables length from the pier. She was moving slowly up and continued to do so until she reached a good anchorage out of the channel opposite Hoboken. Her anchor was dropped, and it became evident that the passengers would be landed first at Pier No. 50. Thither the crowds on No. 47 hastened and succeeded in getting good positions at the lower end of the pier. There were very many ladies among the number and the excitement was universal. A little before 9 o'clock the Only Son was seen to leave the Greece and head for the Transatlantic Company's Dock." "Captain Garland's men did good service by clearing the landing stage and its vicinity of the excited persons. 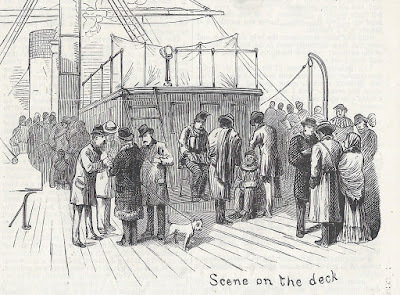 When the tug came along and the gangplank was run out, the officers and crew of the Europe stepped ashore and filed into the gas-lit dock house. They presented a sadly comical appearance. Each man wore just what the had when he deserted his ship, and around his waste a cork life preserver securely fastened. These, they said, were taken to be cherished as souvenirs of the Europe". "The officers wore their uniforms, lace bands, and brass buttons, and seemed anxious to escape general observation, and get away as fast as possible. This they could not do, because the company had arranged to billet them at certain hotels and boarding-houses in the City, so they had to wait until they received their assignment. Meanwhile the spectators crowded around them with innumerable questions. The story of the disaster was told by 160 tongues at the same moment. Many a rough tar was interrupted in his recital by the hasty exclamation of welcome and warm embrace of a newly arrived friend how was beside himself, or herself, with joy at seeing the saved sailor". -The New York Times, April 14th 1874 with illustrations from Frank Leslie's Illustrated Newspaper, May 2nd 1874. The damage to the stern of the Greece. On board the Greece, at anchor on the Hudson River. 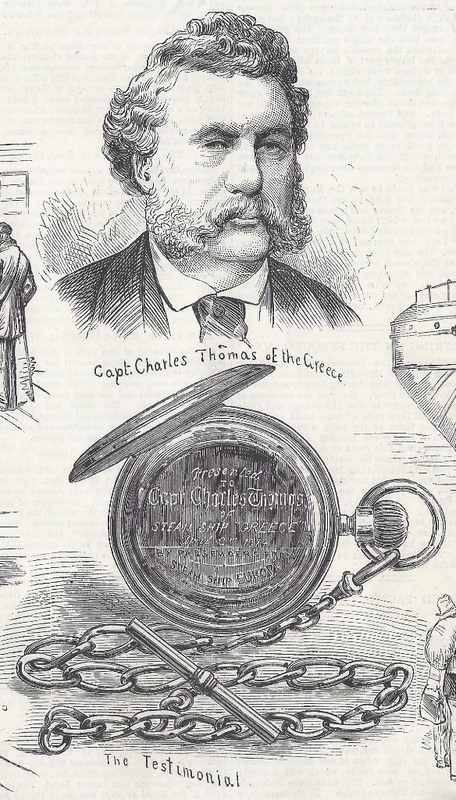 In contrast to the officers of the French ship, Captain Thomas and the crew of the Greece were regarded as heroes by the press, and by the passengers of the Europe, who presented Thomas with a watch commemorating the rescue. Wilhelm and Maria had arrived in the United States, twenty one days after departing Liverpool and twenty six days from starting out from Hamburg. 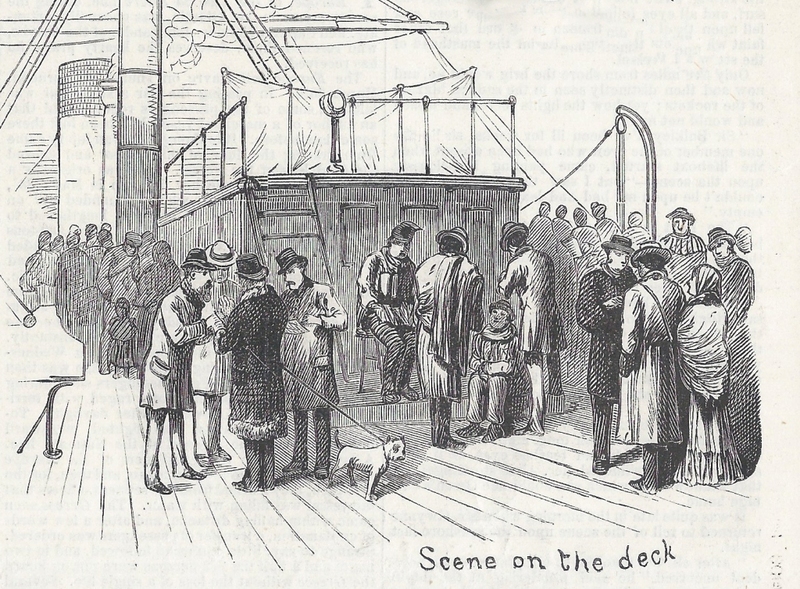 Upon disembarking, the passengers were ferried to Castle Garden, the immigrant depot on the tip of Manhattan Island (on the site of today's Battery Park) where "... immigration officers counted them and obtained information regarding age, religion, occupation, and the value of personal property. 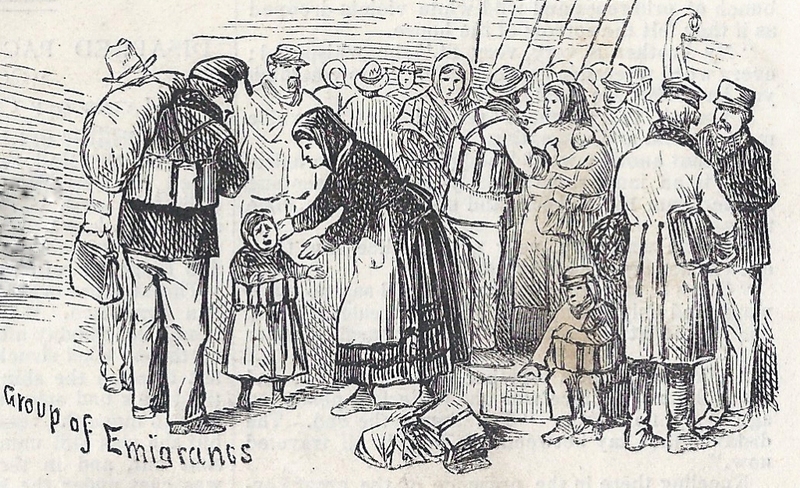 Immigrants were required to bathe with soap and water. And though few ever received direct financial assistance, they were able to exchange money, purchase food at reasonable rates (kitchen facilities were provided), buy railroad tickets, and receive job advice, all relatively free from the influence of predatory "providers." There was no formal housing there, but immigrants were provided with temporary shelter". - Immigrants to North America, www.immigrationtous.net . Castle Garden on the southern tip of Manhattan Island. It was replaced by Ellis Island in 1892. Cover page of the passenger manifest from the SS Greece, filled out at Castle Garden, April 14 1874. The Europe's passengers were tallied separately. Wilhelm and Maria's entries, from the Greece's April 14 1874 manifest, the 6th and 7th lines beneath the crease. From New York City they resumed their journey. Earlier immigrants from the Uckermark had traveled by the Hudson River, then west on the Erie Canal. By 1874 it was far more likely that they went by rail via the New York Central and its affiliated Vanderbilt owned lines. It is possible they visited friends or family in Niagara County, New York, and / or Macomb County, Michigan but such scenarios can not be advanced beyond conjecture. 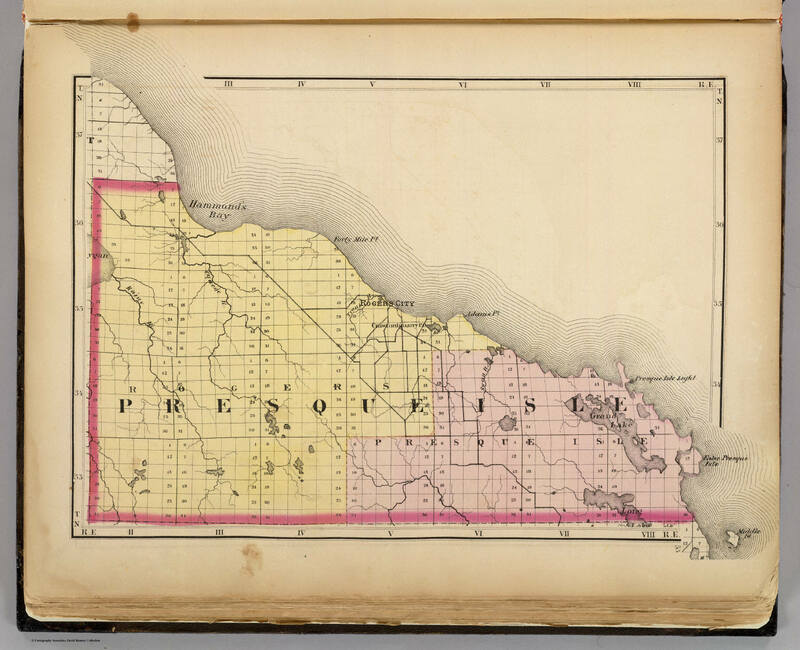 There were no railroads north of Bay City Michigan. Most travelers to Presque Isle County arrived by steamboat. The Marine City, a side-wheel passenger and freight steamer owned by the People's Line conveyed many early settlers to Rogers City and Crawford's Quarry according to Almost an Island, Early Histories of the Shoreline Settlements in Presque Isle County. It is likely that it, or a similar vessel, was used by them for the last stage of their journey. It is not known how long it took them to travel between New York City and Presque Isle County. 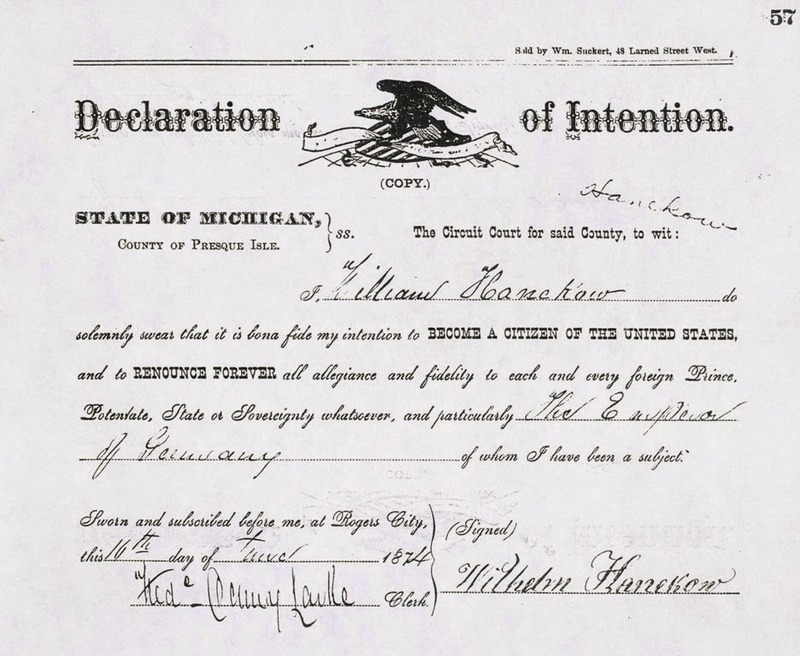 Wilhelm's certificate stating his intent to become a citizen was filed in Rogers City on the 16th day of an illegibly written month. The earliest it could have been signed would have been on May 16 1874. If that was the case, their entire journey from Battin to Presque Isle County would have taken nearly two months. Presque Isle county map 1873, one year before Wilhelm and Maria's arrival. Rogers City Michigan was five years old when Wilhelm and Maria arrived. German was widely spoken but there was much that was unfamiliar in the remote town. Lutheran families that had first arrived in Niagara County in the 1840s had, within a generation, ceased to build their houses in the traditional half timbered (Fachwerk) style of their former homeland and had adopted American wood frame and clapboard construction. Unlike in the Uckermark, farmers tended to live on the land they worked rather than in villages. 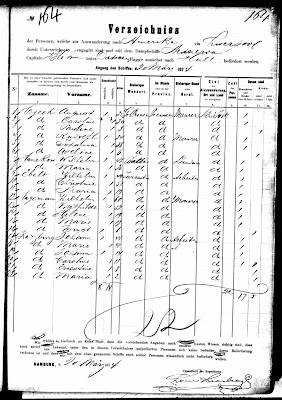 In the census of 1880, Wilhelm and Maria, listed as William and Mary, had a farm in Belknap Township, outside of Hagansville in Presque Isle county. They had three children. Most of their neighbors came from Germany, but there were English, Scottish and Irish as well. They owned forty acres of land, eight tilled aces and 32 still in woodland (much of what would later be farmland in the area was still heavily timbered at the time). They owned forty dollars worth of farm equipment and eighty dollars worth of livestock. 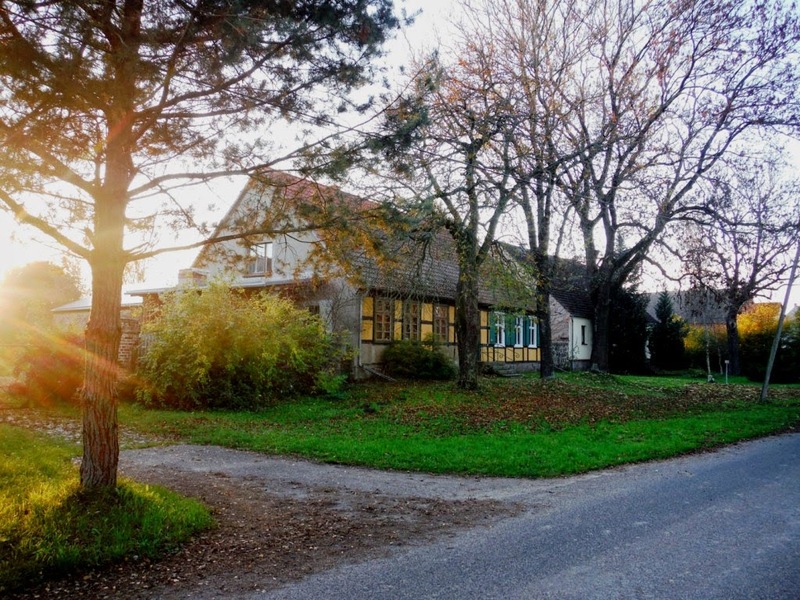 It was a small farm relative to some of its neighbors, and stories have been passed down that Wilhelm also received some sort of stipend from relatives in Battin. It is very unlikely either one of them ever revisited Germany. Continuity with their past though seems to have been of importance. Their daughter, Anna, was named for Wilhelm's mother, while their son, August, was named for Maria's father. In 1884 they donated a half acre of land to the St. Johns Society of Belknap for the establishment of a Lutheran church in at Hagansville. Copy of Wilhelm and Maria's donation to the St. Johns Society of Belknap. Courtesy of Byron Haneckow. Maria died in 1903, Wilhelm in 1909. Both are buried in the St. Johns Hagansville Lutheran cemetery. By the time of their deaths, they spelled their last name with the addition of the c, which was adopted in Germany in the years that followed their departure. Contact between the American and German members of the family seems to have continued until around 1946. Knowledge is lost over generations. In the United States, information prior to immigration is often sparse. Friedrich Wilhelm Haneckow arrived in America from Germany in 1874. Until recent times little was known about his origins and background. My interest in tracing the origins of Friedrich Wilhelm and his wife, Marie Charlotte Goetsch is long standing. Years ago, on a family vacation, I was introduced members of the Lamb family at their farm near the town site of Hagansville in Belknap township, Presque Isle county Michigan. They were related to two of Friedrich Wilhelm’s daughters: Anna Augusta Marie and Pauline, both of whom married two brothers in that family. I was a history minded teenager and they were happy to share what they knew. They showed me old photographs, one said to be of Friedrich Wilhelm in a uniform with ceremonial fringe on his headgear. Over time more specifics emerged. 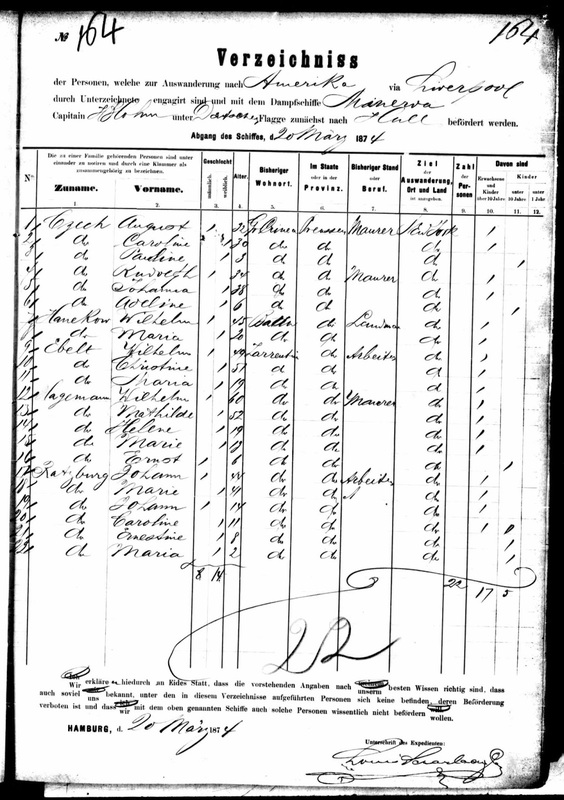 Friedrich Wilhelm’s Michigan death certificate (1909) noted he was born in a place called Battin. The certificate also stated that his father was also named Friedrich Wilhelm and his mother was Gertrud Karsten. Some theorized that Battin might actually be Stettin, the former German port city now known as Szczecin, in Poland. 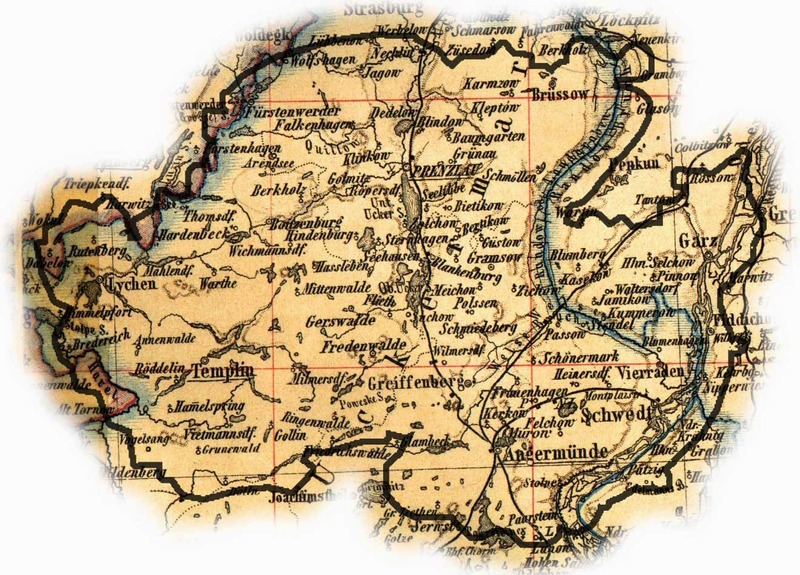 Others forged a speculative link between Friedrich Wilhelm and the Hankow family of Prenzlau, in Brandenburg, utilizing records available through the Church of Latter Day Saints. The advent of the internet brought more clues. I came across an entry from the Amtsblatt der Regierung in Potsdam that recorded a land transaction by Friedrich Hanekow of Battin, dated December 13 1872. I also found a manifest from the first leg of Friedrich Wilhelm and Marie’s voyage to America (Hamburg to Hull England) in 1874. It also listed Battin, a village in the Uckermark district of Brandenburg, near the city of Prenzlau, as their point of origin. I focused my searches on the Battin / Prenzlau area, using as many permutations of the last name as I could imagine. 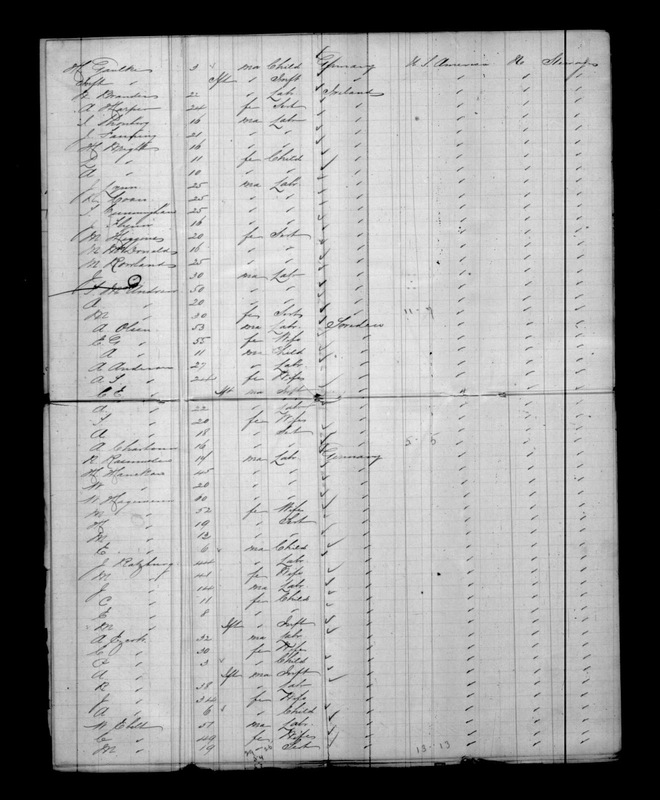 I found Prussian emigration records for a Wilhelm Henrich Erdman Hahnikow and his wife Wihelmine Christine (Schulz) who departed he village of Bietikow, near Prenzlau, for America in 1872. I traced them to Macomb county Michigan, near Detroit, where they settled. To this day, descendents, spelling their last name Hanekow (no c,) still live in the Detroit area and elsewhere. Almost certainly they were related to Friedrich Wilhelm Hanekow but it is not yet known how. I discovered a 1924 directory entry for Pauline Haneckow, a kleinrentnerin (small pensioner) from Bussow (not to be confused with Brussow,) in Kries Friedeberg, Neumark , (now in Poland). I also came across a reference to an article that appeared in the Heimatkalender fur den Kries Prenzlau 1929 (1928) titled Mutter Haneckow als Erzieherin (Mother Haneckow as an Educator). Intriguingly both used a spelling current to the United States. Battin, Bietikow and Prenzlau are in close proximity to each other. Bussow was further east, but still in the general region. I was honing in, but the answers remained out of reach. Through Facebook I was able to contact members of the Hanikow family in Germany. They trace their roots to the village of Tremmin, West-Havelland in Brandenburg. Given the obvious similarity of names and shared Brandenburg origins, a connection appears likely, but prior to Friedrich Wilhelm’s generation. Eventually I felt I had gone as far as I could. Barring a trip to Germany, I needed assistance from a professional researcher who could visit archives. Someone with the skills to find the pertinent records and the background to appreciate their context. I contacted him in August 2014. He thought a visit to the church archives in Berlin would bear fruit. Upon investigation, he found out that the Battin church records were in Brussow, two hours the north of Berlin. Brussow’s were some of the few Brandenburg church records that had never been microfilmed. He set up an appointment for a visit in October. I was heartened by the setback. It made sense. If the records were never microfilmed, it explained the elusive nature of their subject. It also justified my decision to seek help. No amount of internet searching would have found them. I was cautiously optimistic. I was giddy with anticipation. 1828 Nr. 15, Friedrch Wilhelm, den (8) achten December, fruh 8 acht Uhr, eheilch, Christian Friedrich Hanekow, Bauer u. Kirchenvorsteher, Anne Christine geb. Kersten, verehl. Hanekow, Battin, den vierzehnten (14) December, Ewald, 1. Jungfer Friederike Rube, 2. Bachelor Johann Fahrenwaldt, 3. Jungfer Marie Kersten, 4. Bauer Friedrich Flashaar, 5. Junggeseil Gottfriedt Flashaar. Nr. 15, [name:] Friedrich Wilhelm, [date of birth:] Dec 8, 8 am, legitimate, [father:] Christian Friedrich Hanekow, farmer and churchwarden, [mother:] Anne Christine born Kersten, married Hanekow, Battin [date of baptism:] Dec, 14, [pastor:] Ewald, [godparents:] 1. Virgin Friederike Rube, 2. Bachelor Johann Fahrenwaldt, 3. Virgin Marie Kersten, 4. Farmer Friedrich Flashaar, 5. Bachelor Gottfriedt Flashaar. After decades pondering their existence, they were suddenly in sharp focus. Speculations and rumors were dispelled, confirmed or clarified. On Friedrich Wilhelm’s death certificate (1909) his father’s name was listed as also named Friedrich Wilhelm. The church records clarified that he was Christian Friedrich Hanekow, famer, sheriff and churchwarden. His mother, Gertud Karsten on the death certificate, became Anne Christine Kersten. Friedrich Wilhelm had four brothers and six sisters. Close reading revealed their joys and sorrows. By sorting through the many godparents their social network emerged. I spent hours placing entries in context to each other. In the meantime, unbeknownst to me, a cousin of mine, Don Haneckow, and his wife Johanna were pursuing a very similar line of research. They were able to establish, beyond a doubt, Friedrich Wilhelm and Marie Charlotte's passage on the ship Greece between Liverpool and New York. In December 2014 they visited Battin. It is likely the first time a descendent of Frederick Wilhelm and Marie Charlotte had returned to their point of departure. 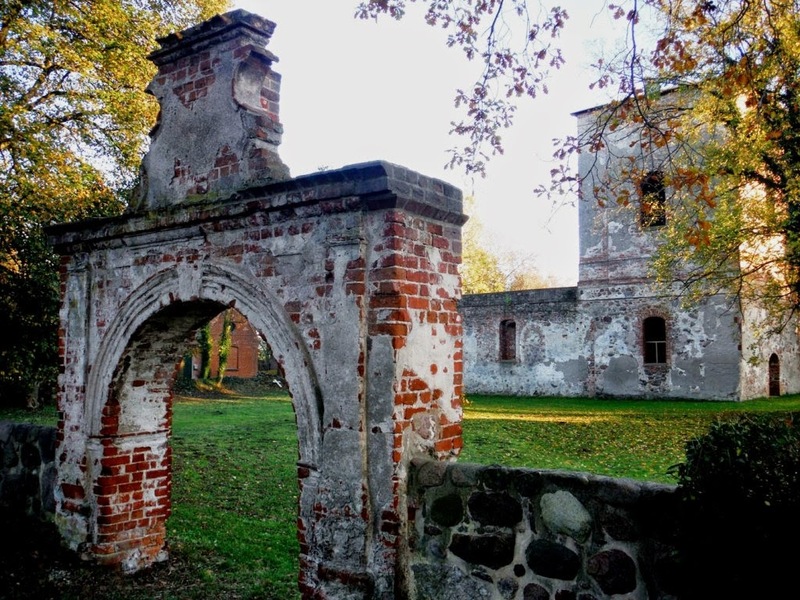 They searched civil records and visited the ruined church in Battin. The grave yard no longer existed as such, but nearby they found a newer cemetery with reproduced markers of relatively modern vintage. Three are for names that appear in the retrieved Battin church records. Who placed the markers is a mystery, but implies that there still might be Haneckow relatives near Battin. What follows is an attempt to place the information from the church records into the larger framework of time and place. I will continue to pursue information with Marc Jarzebowski, Don Haneckow and others and plan to update, expand and revise this piece as more information becomes available. 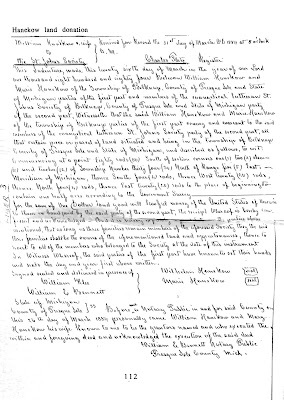 Anyone who would like a copy of the retrieved Battin church records report, or has comments, corrections or insights can email me at dhaneckow (at) comcast.net. A note on orthography. The last name has been spelled many ways, both in Germany and America. The Battin church records utilize four: Hanekow (no c) is used exclusively in the records from 1824 to 1862, with periodic usage thereafter to 1876. Hahnekow makes its appearance in 1865 and stops in 1876. Haneckow (with c) appears in 1876. It emerges as the exclusive spelling after 1897 (the last church records are from 1901). It can be assumed that spelling spread from Germany to America, where it became common after 1910 (Friedrich Wilhelm's and Marie Charlotte's grave stones in Belknap Township Michigan spell it as such). Hahnikow appears once, in 1882, in the entry for Anna / Anne Christine’s death. Battin is visible on the map, south east of the city of Brussow. Nearby is the village of Bagemuhl were various members of Anne Christine Kersten’s family lived. Also on the map is the village of Bietikow, south east of Prenzlau, where Wilhelm Henrich Erdman Hahnikow / Hanekow and his wife Wihelmine Christine (Schulz) departed from in 1872 for the Detroit area. 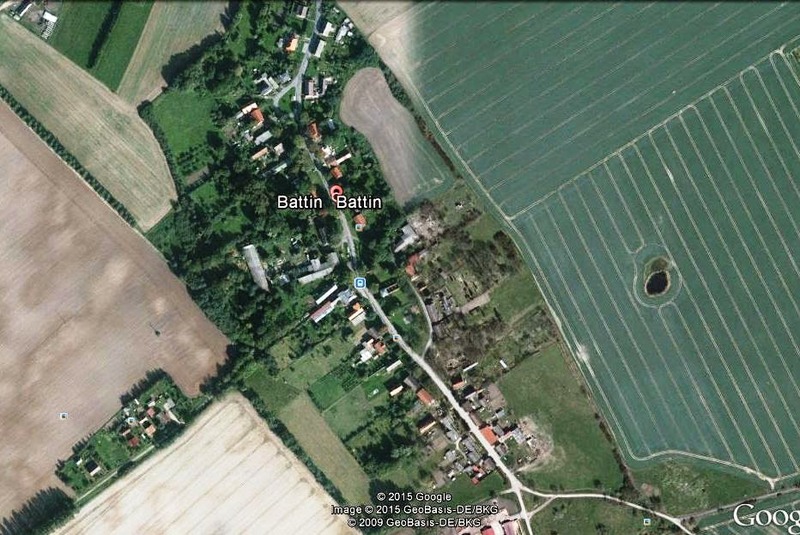 Battin (pronounced Bat-tine) is a small farming village in the Uckermark district of Brandenburg. Administratively it was merged into the adjoining village of Grunberg in 1973. 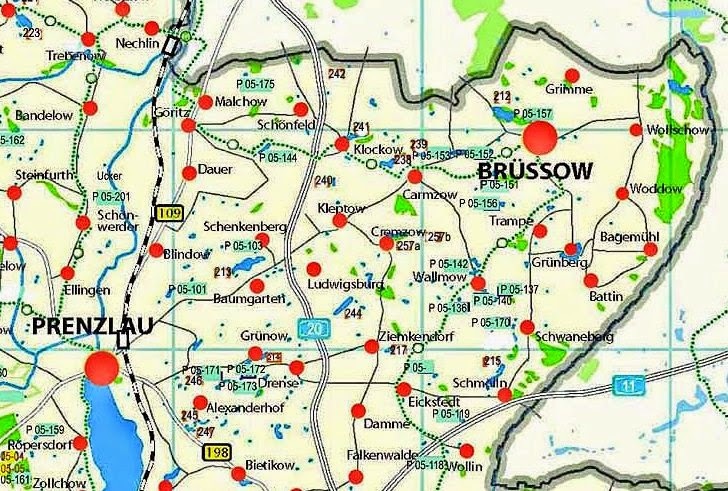 Since 2001 it has been part of the township of Brussow. "Battin seems to be a village at the end of the world. The country road is a dead end here. The region is dominated by fields, cattle and modern wind engines. The church is a ruin after a fire, the cemetery doesn't exist anymore”. –Marc Jarzebowski, describing his visit there on October 28 2014. Church yard entrance and the ruins of the church in Battin. Photo by Marc Jarzebowski. Church ruins in Battin. Photo by Marc Jarzebowski. The earliest parts of the church in Battin, now a ruin, were built in the late middle ages. The Uckermark region was once home of the Ukrani, at tribe of Polabian Slavs (also known as Wends) which settled in the region from Eastern Europe, displacing Germanic tribes, beginning in the 6th century. The area was pressured militarily by both the Holy Roman Empire and Poland for control. In the 12th century it was ruled by the Pomeranian dukes, vassals of the Duchy of Saxony. Gradually the region was Christianized and Germanized, but Slavic origins can be seen in place names ending in “ow” and “in”. Over the next three centuries control of the Uckermark shifted between Brandenburg, Pommeria and Mecklenburg before being secured by Brandenburg in 1448. Brandenburg was devastated during the Thirty Years’ War (1618-1648) a conflict between Protestant and Catholic that would involve the Holy Roman Empire, Sweden, Denmark, Spain, the Dutch Republic and France. “For the people of Brandenburg, the war meant lawlessness, misery, poverty, depravation, uncertainty, forced migration and death.” Christopher Clark wrote in Iron Kingdom, the Rise and Downfall of Prussia, 1600-1947. The Uckermark was particularly hard hit by the conflict. In a 1652 survey, it was noted that in Locknitz, some ten miles to the north of Battin, 85% of farms that had been in operation before the war were still deserted. Battin’s church was partially destroyed. After the war, the most devastated areas were repopulated by Dutch, East Friesan and Holstein immigrants. In 1685 Elector Friedrich Wilhelm of Brandenburg - Prussia invited some 20,000 persecuted French Calvinist Huguenots to settle in areas whose population had not recovered. Battin was chosen for the location of one of the Huguenot colonies. The church in Battin was restored in the early seventeen hundreds, sometime after the arrival of the Huguenots. The tower was completed in 1743. In the Haneckow entries of the Battin church records Huguenot last names appear with regularity as spouses, godparents and pastors. 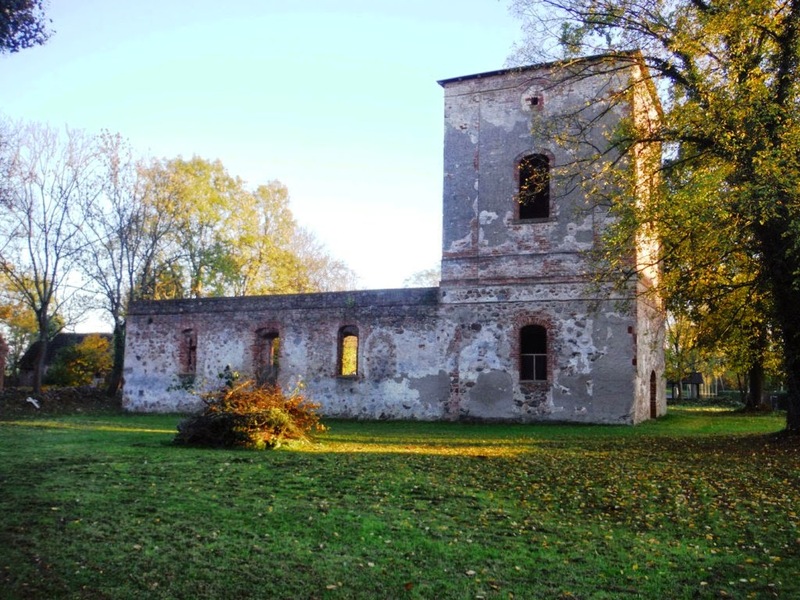 At the end of World War Two, Battin’s church was heavily damaged yet again. In recent times the ruin was stabilized for use in cultural events. A google earth view of Battin. Battin. Photo by Marc Jarzebowski. Grave markers in the new cemetery, Battin. December 2014. Photo by Don Haneckow. Christian Friedrich Hanekow was born in 1798, likely in Battin. He was a small farmer, or cottager, as well as a church warden (Kirchenvorsteher) , a lay church official. He also held the positions of Schulzen (sheriff) Gerichtsmann (juror) and Gerichtsschulz (court sheriff). Schulz in German translates to a local law enforcement official, bailiff, magistrate or village mayor. Anne Christine Kersten (also listed as Anna Christina Kersten) was born in July 1803. It is possible that she was from the nearby village of Bagemuhl as members of the Kersten family, godparents of her children, were listed in the church records as farmers from there. Christian Friedrich and Anne Christine had ten children. Christian Friedrich died in Battin on August 2 1866 at 7:30 am of nerve fever. Anne Christine died in Battin on March 28 1882. 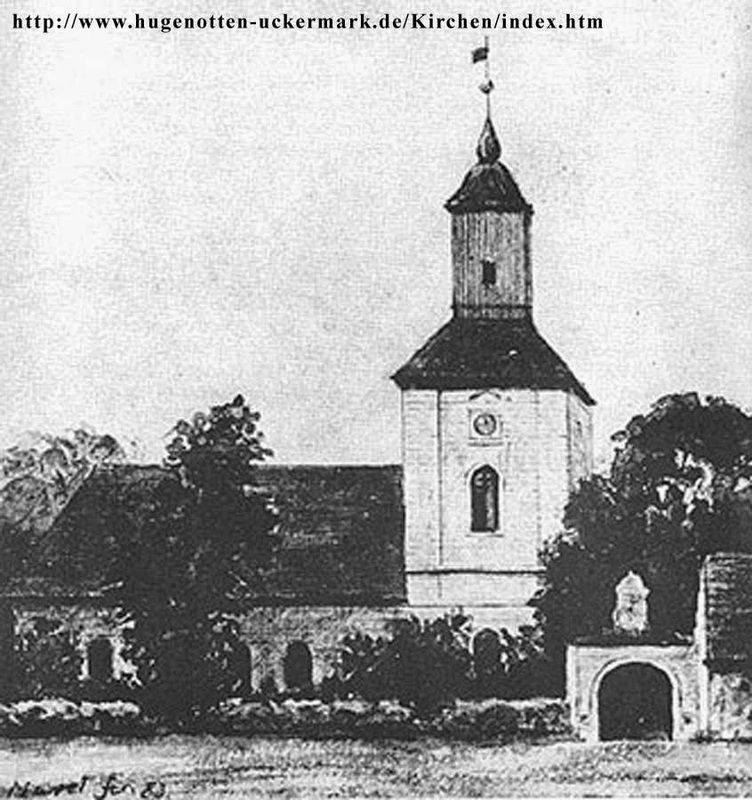 The church in Battin as it appeared when Christian Friedrich Hanekow was a church warden. The first child of Christian Friedrich and Anne Christine was born in Battin on April 14 1824 and died on August 24 1824 in Battin. Maria was born in Battin on March 19 1825. She appears in no other of the retrieved church records. She died on January 9 1913 and was buried in Battin. (per Don Haneckow who photographed her grave marker on December 8 2014). On the marker her name is spelled Marie Haneckow (later spelling, with c). Marie Haneckow (Maria Hanekow) grave marker the new cemetery, Battin. Photo by Don Haneckow. Michael Friedrich was born in Battin on February 9 1827. He likely went by the name of Friedrich (and is probably the Friedrich Hanekow in the 1872 entry in Amtsblatt der Regierung in Potsdam ). Michael Friedrich married Marie Wilhelmine Hubener on November 2 1869. Their children were: Auguste Emilie Johannna Hahnekow (January 11 1870-May 18 1870), Anna Luisa Hahnekow (born 1871) and Emilie Marie Auguste Hahnekow, (born March 28 1874). Her grave marker of was photographed in the Battin church yard by Don Haneckow on December 8 2014. It notes that she died on April 8 1965, and that she was married to a member of the Sy family. (Her uncle, Christian Hanekow, see further below, was also married to a Sy). 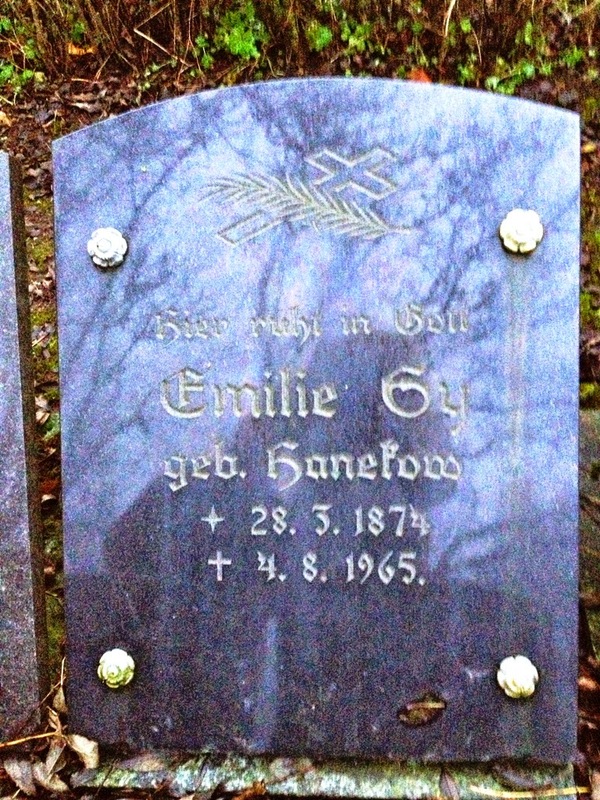 Emilie Sy, formerly Hanekow (born Emilie Marie Auguste Hahnekow), daughter of Michael Friedrich, grave marker in Battin. Photo by Don Haneckow. At the time of his marriage in 1869, Michael Friedrich was listed as a farmer’s son. In 1897 and 1901 he was listed as an owner in Battin. Friedrich Wilhelm was born in Battin on December 8 1828 at eight in the morning. He went by Wilhelm (later William in America). The first three sons of Christian Friedrich all had Friedrich in their names. The reverse order of Friedrich’s name, in contrast to his brothers, might be in honor of King Friedrich Wilhelm of Prussia. In America the story was told that Friedrich Wilhelm was not himself a farmer in Germany, but in a clerical profession, perhaps something to do with law. Nothing in the church records confirms or denies it, but as a younger son he would not have inherited his father’s farm. Marie Charlotte Goetsch was born on June 22 1854. Her father was August Friedrich Goetsch, a barber in Prenzlau. Friedrich Wilhelm and Marie Charlotte were married in Battin on February 15 1874. It was the first marriage for both of them. Three months later they emigrated to America. They departed Hamburg on the ship Minerva on May 20 for Hull, on the east coast of England. They traveled overland by train to Liverpool. The Hull-Liverpool route was usual for German emigrants departing from Hamburg. In Liverpool they boarded the ship Greece for the transatlantic passage. They arrived in New York on April 14 1874. from there they continued on to Rogers City in Presque Isle County Michigan. Friedrich Wilhelm's letter of intent to become a citizen of the United States (1874). Friedrich Wilhelm (William in the US) and Marie Charlotte had seven children: Anna Augusta (1874-?, likely died very young), August Wilhelm (1876-1949, married to Anna Augusta Marie Flurshutz), Pauline (1878-1933, married to Henry Lamb), Augusta Anna Marie (1879-1962, married to George Lamb), Albertine (1881-1976), Christian (1885-1916), Magdalene (1892-1892). The Haneckow family in the United States that spells their name with a c, are descended from August Wilhelm. 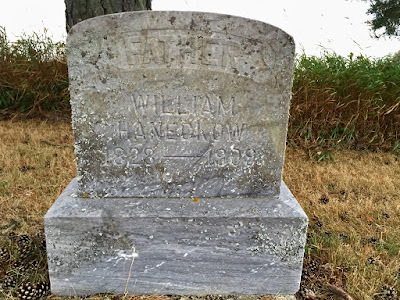 Friedrich Wilhelm died in Presque Isle County on February 16 1909. Marie Charlotte died on October 26 1903 in Rogers City, Presque Isle Michigan. They are both buried at the St John Lutheran Church in Belknap Township on land they donated to the church upon its establishment (last name is with a c on both grave stones). Louise was born in Battin on November 19 1830. She died in Battin of consumption on October 16 1838. Christoph Friedrich was born February 17 1833 in Battin. He married Maria Dorothee Scherping on November 2 1862. Maria (born 1832) was the daughter of Johann Scherping, a farmer. 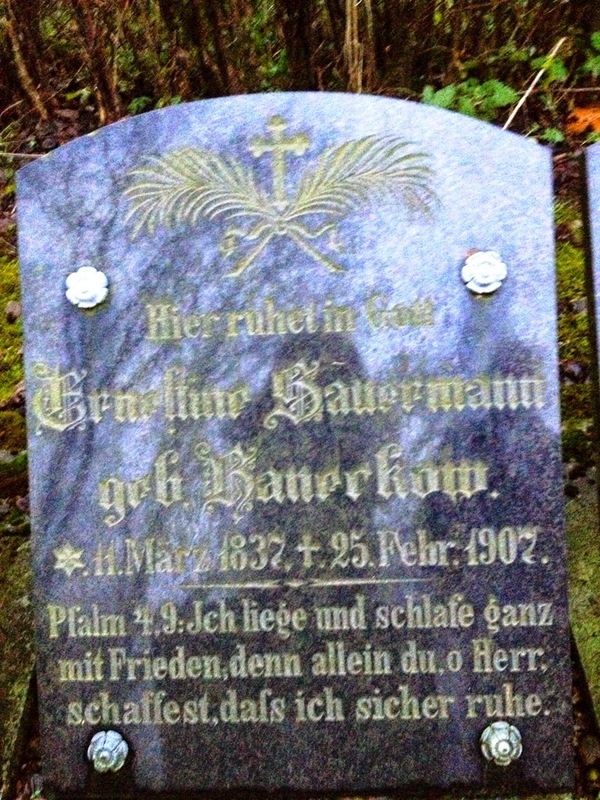 Their son, Gustav Friedrich Hanekow (1863-1868) died in Battin of scarlet fever. Maria Dorothee died on April 18 1865 in Battin of pelvic inflammation. Christoph Friedrich married Auguste Pauline Thiele in Battin on May 11 1875. 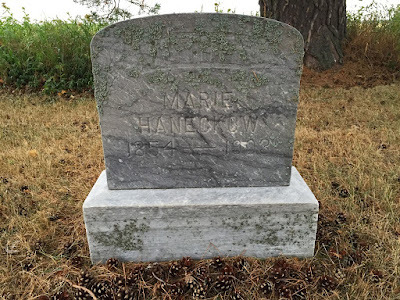 They had two daughters, Elizabeth Anna Pauline Hanekow (1876-?) and Gertrud Paulina Victoria Hanekow (born 1878). At the time of his marriage in 1862, Christoph Friedrich was listed as a farm laborer in Battin. In 1868 he was listed as a day laborer in Battin. 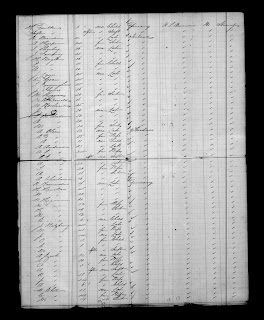 At the time of his second marriage in 1875, he was listed as a widower, small farmer (crossed out) and pensioner. In 1876 he was listed as a small cottager. It is not known when or where Christoph Friedrich died. Christine was born January 28 1835 in Battin and died May 13 1858 in Battin of consumption. Ernestine was born in Battin on March 11 1837. She had a daughter, Elisabeth Ludovike (January 1865-February 2 1865) who died in Battin. Ernestine married Wilhelm Friedrich Sauermann, a farm laborer in Battin, on October 28 1876. William Friedrich was the son of Christian Friedrich Sauermann, a day laborer in Battin. Ernestine died in Battin on February 25 1907. Ernestine Sauermann, formerly Haneckow (Ernestine Hanekow). Photo by Don Haneckow. Louise was the second daughter of Christian Friedrich and Anne Christine to have that name. She was born in Battin on January 27 1839 and died in Battin on January 26 1841. Christian was born in Battin on November 10 1841. He married Frederike Magdaline Sy (born 1855) on November 23 1876. Frederike Magdaline was the daughter of Johann August Sy . The Sy family were Huguenot in origin. Christian’s niece Emilie Marie Auguste Hahnekow / Hanekow also married a member of the Sy family (yet unknown first name). At the time of his marriage in 1876, Christian was listed as a farmer in Battin. Christian died on September 17 1898 in Battin. At the time of this death he was listed as a farmer and church warden. Christian Friedrich Hanekow and Anne Christine Kersten’s last child was a male, born and died on May 11 1843 in Battin. 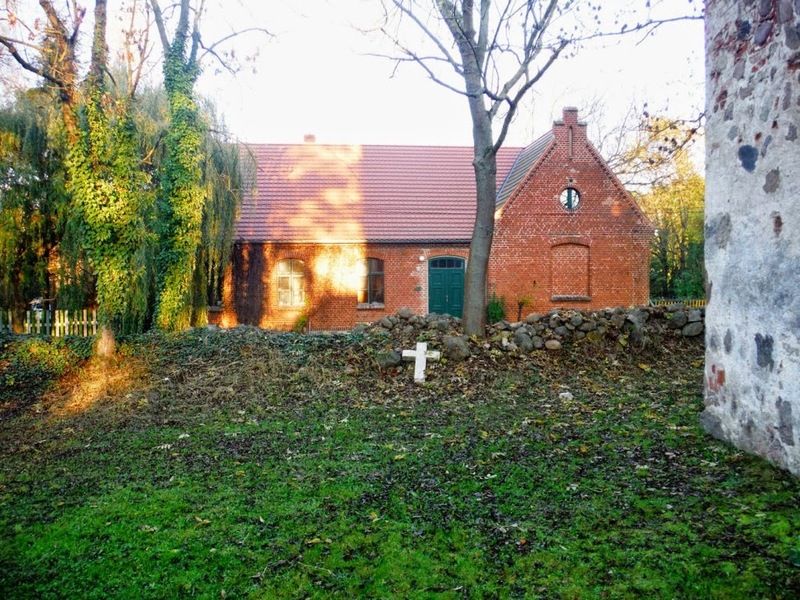 A portion of the old church yard in Battin. Photo by Marc Jarzebowski. Answers bring questions. 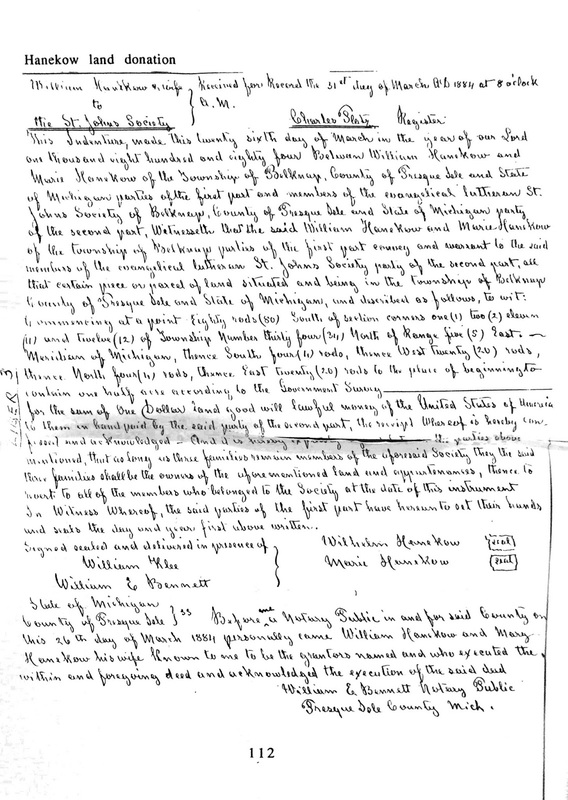 The church records mention a Peter Haneckow, whose relation to the rest is unknown. Who was he? What of the time before the records or after? Why were some grave markers recreated in the new cemetery but others are not, and by whom? (Don Haneckow is pursuing this). Are there still relations in the Battin area? It is my hope that this will be an evolving project. Information, comments and insights are welcome.